Cortex Plot Points is Live! It’s here, it’s here! 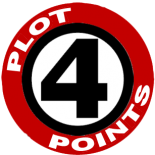 You can go now to Cortex Plot Points now to see our introductory post as well as a great post by Joshua Unruh of the Caped Crusader himself, Batman. We hope to have more stuff up soon with Hellboy, some Firefly stuff and more! Check back in soon! This entry was posted on November 14, 2013 by Mark in News.